because we help them deal with these challenges every day. Click the Hazardous Materials Commonly Found in Vehicles Infographic to enlarge. The above image is from the PHMSA Auto Flyer, Yes, It's Hazmat!, for the Office of Hazardous Materials Initiatives and Training, January 2008. It has been update by Labelmaster to include the new hazard class 9 label, lithium battery label, and other various updates. 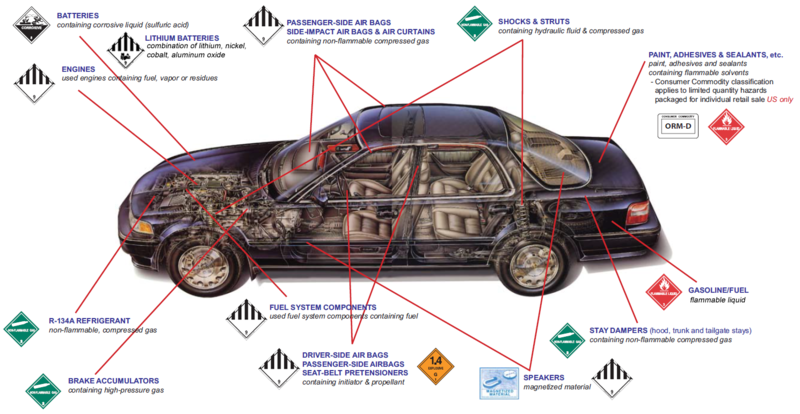 Get your automotive industry hazmat labels from Labelmaster! Paint, Adhesives, and Sealants, Etc. Whether you need Dangerous Goods products to ship your hazmat, training, regulations, packaging, or labels, placards, and markings Labelmaster has it all... and most of it ready to ship next day. From hazmat labels and UN certified packaging, hazmat placards and regulatory publications, to advanced technology and regulatory training, Labelmaster’s comprehensive offering of industry-leading software, products, and services help customers remain compliant with all dangerous goods regulations, mitigate risk and maintain smooth, safe operations. Order your automotive products today! Labelmaster's Dangerous Goods Information System (DGIS) makes hazmat shipping as easy as non-regulated shipping. Say farewell to fines and returned shipments. Stop wasting time with indecipherable regulatory manuals. Boost your efficiency and your bottom line with DGIS — the industry's most robust, flexible, and advanced hazmat shipping software. If you are in the automotive industry, you are possibly having to ship DG on a regular basis. DGIS can help save you time and money. DGIS is easy-to-use, validate you shipping data against the latest regulations, and makes your entire operation more efficient - reducing fines and delays. Get DGIS today and ship DG with confidence! Get expert knowledge, years of experience and a healthy dose of peace of mind. From navigating ever-changing regulations to leveraging regulatory exceptions to giving practical customized advice, Labelmaster Services handles every detail for compliant, efficient and stress-free DG shipping. Your source for important industry information. We have so many resources for our Automotive Industry. Here is our top 10 automotive resources, then go see the full list of automotive resources. Airbag inflators, airbag modules, and components are defined as 'Dangerous Goods' Class 9 and require special attention when shipping, this includes using hazmat labels and UN packaging. Make sure your airbags and components get to their destination without delay by ensuring these devices are properly packaged and labeled. You can do it and Labelmaster is here to help! Labels, placards, and markings are indispensable compliance products. Adhering to stringent regulatory standards, Labelmaster offers a multitude of options designed to help you comply with hazmat regulations. Choosing the correct labels and placards is vital for the safe handling and shipping of hazardous materials. Need help staying on top of the ever-changing lithium battery regulations? We are here to help you stay compliant! If you ship lithium batteries, you know that the rules are complex and ever-changing. The following resources help you navigate the complexities, no matter if you ship stand-alone lithium ion or lithium metal batteries, batteries packed in equipment, or damaged lithium batteries for reverse-logistics. A process that starts with the right label. If you ship hazardous materials, compliance is a big part of your world. But have you ever stopped to think about what compliance really is? Compliance is getting your shipment there without frustration. Compliance is protecting people, property, and products. Compliance is job security. Compliance is everything. 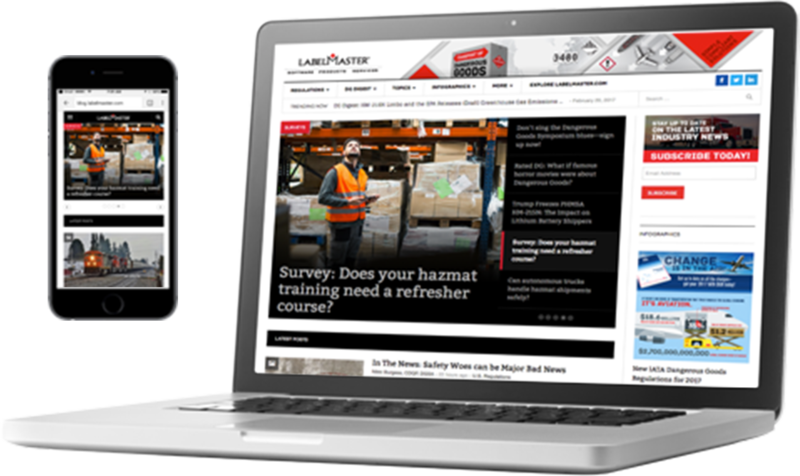 Labelmaster has been the go-to source for companies – big and small – to navigate and comply with the complex, ever-changing regulations that govern dangerous goods and hazardous materials. Labelmaster has produced many of the industries best dangerous goods and hazardous materials infographics. You name the topic and we probably have the infographic for you. Not all labels are created equal. Labelmaster provides the most durable, compliant labels that can help your products get from point A to point B safely and compliantly. There are labels. Then there are Labelmaster labels. We have labels to move it, store it, assure it, and create it. More info with our Anatomy of a Label infographic. If you handle hazardous material or hazardous waste, or if you are a shipper, carrier or freight forwarder, the 49 CFR is a must. These regulations cover requirements for markings, labels, placards, shipping papers, training, emergency response and performance-oriented packaging standards. Domestic transportation regulations for highway, rail, air and water are included. Find helpful hints and tons of information for navigating the complicated process of DG shipping, increasing efficiencies and solving common issues including: hazardous materials definitions, most common hazmat, DG training requirements, shipping guides, hazmat label and placard material types and DOT specifications and requirements, and much more. The third annual Global Dangerous Goods Confidence Outlook is the definitive outlook for the worldwide dangerous goods industry based on the thoughts and attitudes of DG pros across the globe. In an effort to better understand today's DG landscape, Labelmaster, IATA, and Hazardous Cargo Bulletin partnered to survey DG professionals around the globe about how their organizations approach DG shipping and handling and the specific compliance challenges they face. Stay up-to-date on the latest automotive industry news. For more than five decades, Labelmaster has been the go-to source for companies – big and small – to navigate and comply with the complex, ever-changing regulations that govern dangerous goods and hazardous materials. Labelmaster is your partner in keeping your business ahead of regulations and compliant every step of the way. The Labelmaster blog helps you keep up with constant changes in the regulatory landscape. That is why so many shipping managers, DG trainers and other hazmat pros subscribe. February 28, 2019: Why are American hazmat pros less confident? Two experts weigh in. January 31, 2019: Total value of compliance, Part 2: What do compliance gaps actually cost you?